I’m a fan of egg noodles and I actually prefer stir fried egg noodles instead of the soupy version. To cook the soupy version, you’d need to cook the egg noodles in a separate pot of boiling water, run some tap water over it to stop it from further cooking, then when you’re done cooking the rest of the ingredients in a good soup base, pour it all over the egg noodles. But of course, I digress again. This was supposed to be about stir fried egg noodles. Cook egg noodles in boiling water till the strands have separated clearly (2.5-3min), but have NOT turned soft. Strain and put the noodles under running tap water to stop the heat from further cooking the noodles. Heat oil in wok. Add garlic and fry till fragrant. Add baby corn and fry for a minute. Add julienned carrots and leafy vegetables and cook till the leaves have cooked through considerably (a couple of minutes). Add the beansprouts and fishcake and stir fry for about 20 seconds then add in the noodles. Mix thoroughly then add the condiments and mix thoroughly again. If you have difficulty mixing it quickly, turn the fire down to low heat so the noodles don't get overcooked. Serve with freshly ground black pepper and green chilli, if preferred. I normally serve this topped with shredded omelette. This entry was posted in 1-dish meals, Chinese Food, Food for kids, Recipes, Recipes for the family. Bookmark the permalink. 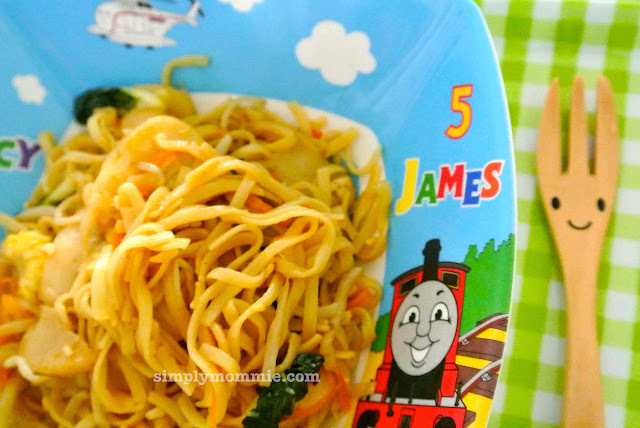 Any particular brand of egg noodles you’ll recommend that is healthier/toddler friendly? You are an inspiration!